Irreparable damage: A rubbish dump in Gulmarg, 50km west of Srinagar. Gulmarg: Tonnes of litter dumped at Kashmir’s showpiece Himalayan resort of Gulmarg are threatening a fragile alpine ecology and endangering villagers dependent on its glacial waters. 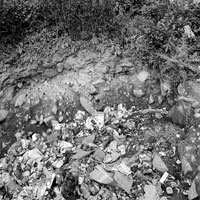 “Mountains of rubbish are killing this tourist resort," local environmental campaigner Abdul Hameed said in Gulmarg, 50km west of Jammu and Kashmir’s summer capital Srinagar. “This stream is a source of drinking water to 18 villages with (more than) 20,000 people. This dump is endangering lives." Gulmarg—the name means ‘meadow of flowers’—features one of the world’s highest golf courses and a gondola lift that carries visitors to an altitude of more than 4,000m (13,000ft). In the winter, the mountains are covered with snow, and an absence of restrictions on off-piste access has won the area a reputation as one of the world’s best-kept skiing secrets. But as temperatures soar across India during the summer, hundreds of thousands of Indians head to the resort for some clean, cool air—but leave behind plenty of waste. “This place stinks," lamented 48-year-old Mohammed Shafi, a trader who runs a food and drinks stall halfway up Mount Afarwat, the peak overlooking Gulmarg. The road up to Gulmarg may be dotted with reminders that plastic is banned in the area, but Shafi said, “Nobody is stopping people from taking food and water up the mountain." Near his stall is a huge spread of rotting rubbish—cardboard boxes, soft drink cans, plastic bottles, polythene bags, beer bottles and biscuit wrappers. The smell is so strong here that tourists pinch their noses. However, none of the hotels in Gulmarg have waste treatment facilities. Refuse is collected in the backyard and later dumped on the outskirts of Gulmarg. “We are in the course of identifying wasteland away from Gulmarg where we can put the trash," said Farooq Ahmed, head of the Gulmarg Development Authority. A state plan calls for waste to be transported daily to a dumping ground more than 20km away. “We are taking all the measures to keep this resort clean," he added. But locals and tourists who make trips on the gondola lift carry food and water bottles that they then dump in the mountains, Ahmed said. The decomposing trash leaches into the glacier-fed streams which are the main source of water for thousands of families and is destroying the area’s delicate flora, environmental group Greenpeace said.